Hundreds of Canada’s best and brightest gathered for the event but only a select few could walk away with an award. More than 500 of Canada’s most eminent HR professionals gathered Thursday evening to celebrate excellence in the industry but while all proved themselves as leaders in the field, only a select few could walk away with an award. “The entries have been of an incredibly high calibre this year and I know the judges have deliberated long and hard,” said Tim Duce, CEO of KMI Publishing and Events – the company which organizes the annual industry gala. “It’s humbling to see the incredible innovation that’s happening in Canadian workplaces and I hope everyone here is proud of what they have achieved,” he added. 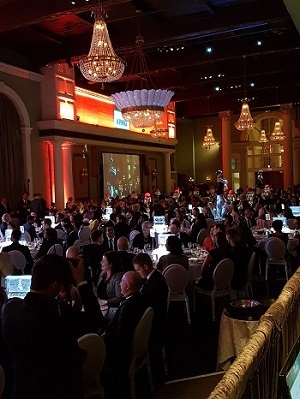 The gala evening saw 20 awards handed out at Toronto’s historic Liberty Grand – the full list of worthy winners is below.